First-place winner Paige Brown, and finalists Meena Jagadeesan and Catherine Jessica Yihui Li open their presents after the Intel Innovation dinner. On March 14, after tinkering at TechShop for Pi Day, the STS 2016 finalists gathered at dinner for the Intel Innovation speeches. 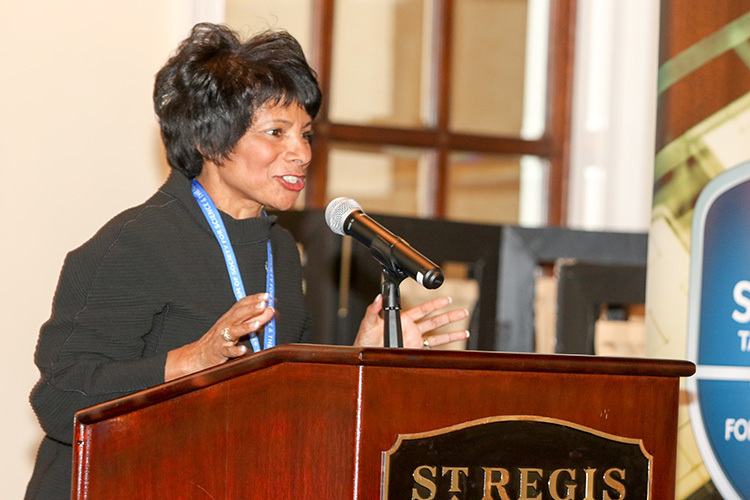 Rosalind Hudnell, the Vice President of Human Resources and Chief Diversity Officer at Intel, called the finalists rockstars. She even snapped a photo during dinner and tweeted it. "I still feel like an underachiever in this audience," Rosalind said. "It's been our honor to host and sponsor Intel STS," Rosalind said. Intel has sponsored the Science Talent Search for 18 years. Previously, the program was sponsored by Westinghouse. Rosalind Hudnell called the STS finalists rockstars. PHOTO COURTESY OF SOCIETY FOR SCIENCE & THE PUBLIC/LINDA DOANE. At the TechShop workshop earlier in the day, where STS finalists worked with elementary and middle school students to build robots, the finalists "said the younger people were even smarter than you," Rosalind said. "Us old people have better keep up because this nation has tremendous brilliance." The world often hears about the impact of STEM, but "we don't hear about the amazing people behind it," she said. "There's so much work that still needs to be done." At the end of the dinner, Intel revealed a gift for all of the STS finalists. The finalists beamed with their new Fossil Q smartwatches, which track activity levels. Intel's Mike Madden also discussed the future of computing and offered advice to the STS finalists. The next thing in computing will be embedded technology, connecting and securing devices everywhere, and devices talking to each other, he said. He works in the lab on how people communicate with technology and how technology communicates with people. "We're preparing for a world of intelligent machines," Mike said. "I truly believe we live in magical times because we can implement what people have imagined." 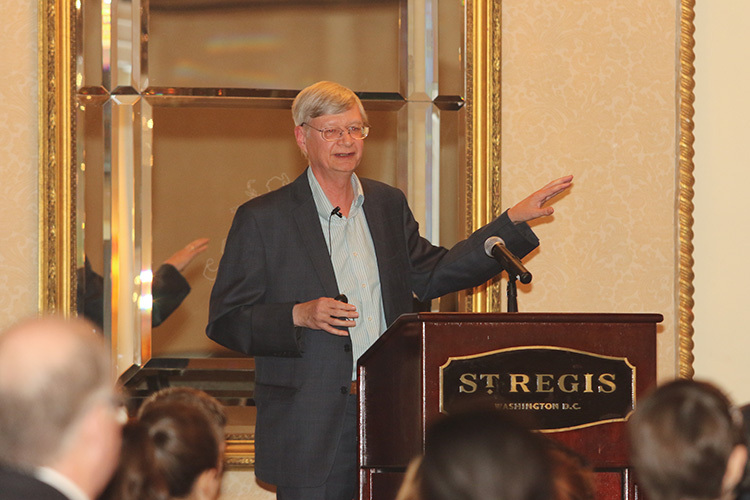 Mike Madden offered career advice at the Intel Innovation dinner. PHOTO COURTESY OF SOCIETY FOR SCIENCE & THE PUBLIC/LINDA DOANE. He is researching artificial intelligence and what protocols to use for interconnected technology. "We shouldn't assume the Internet is the protocol to use," he said. "Hopefully you'll go to graduate school and join to work on these problems." A career is often many random opportunities, he said. "Don't just focus on your own narrow area, but broadly too," Mike said. He loves learning and trying new things, and his work at Intel allows him to do just that. "If we knew what we were doing, it wouldn't be research," Mike assured the finalists. In technology and science, they will be challenged and face difficulties, but that's where they will make discoveries.